Architecture now! 9 / Philip Jodidio. 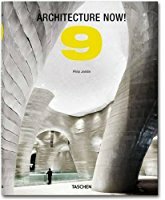 Yayın Adı: Architecture now! 9 / Philip Jodidio. Basım Bilgisi: Köln : Taschen, 2013. Fiziksel Bilgiler: 480 pages : illustrations (black and white, and colour) ; 28 cm. Notlar: Includes index. Language note: Text in English, French and German.